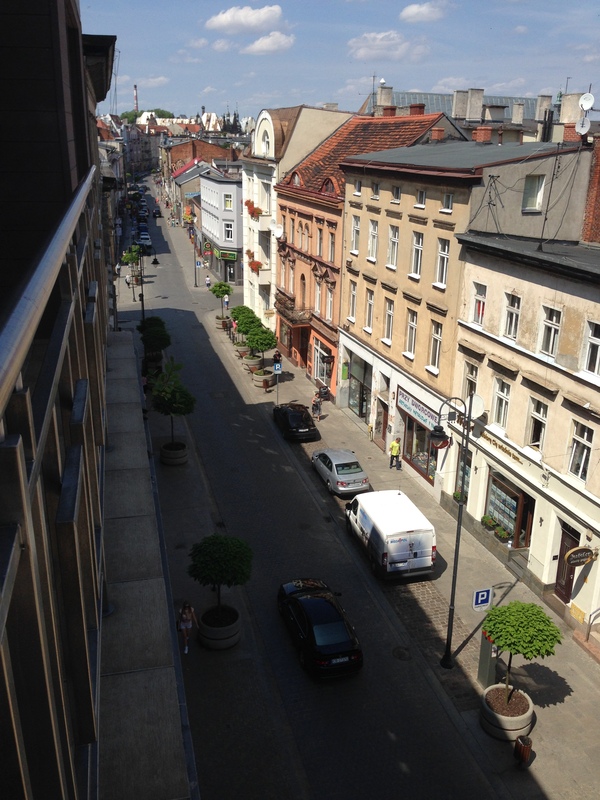 This is a view from the balcony on the street side of our flat, so you can see where we are starting. 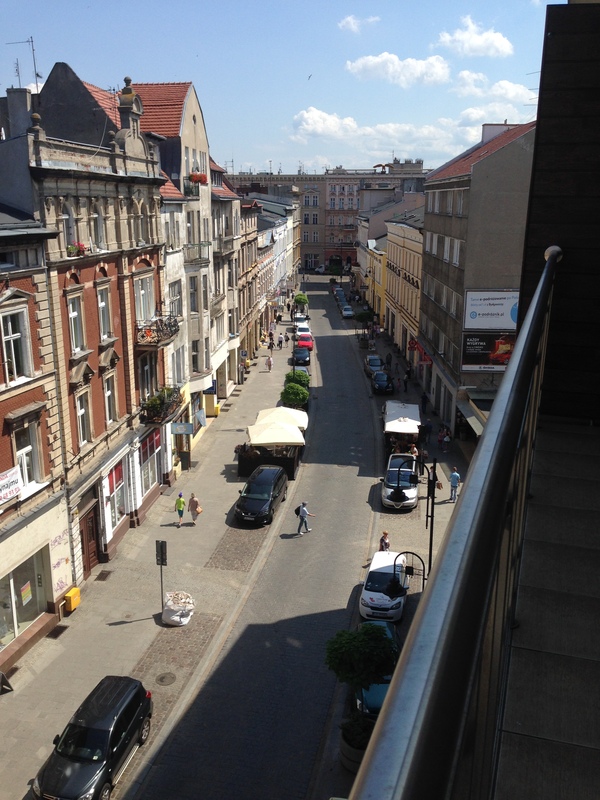 We live at Dworcowa 13, 11 (13 is the number of the building, 11 is our flat number). Dworcowa translated means “Street to the Train Station” and it’s pronounced “Zvorcova” (the letter “w” is pronounced like the letter “v” — a little lesson in Polish for you) If you walked all the way to the end going this direction, you would be at the train station. You can’t see it, but it is less than a mile away. But we aren’t going that way. We are going to walk the other direction, taking a left from our building and walking to the end of the street….toward the building at the end with the Eagle on top. 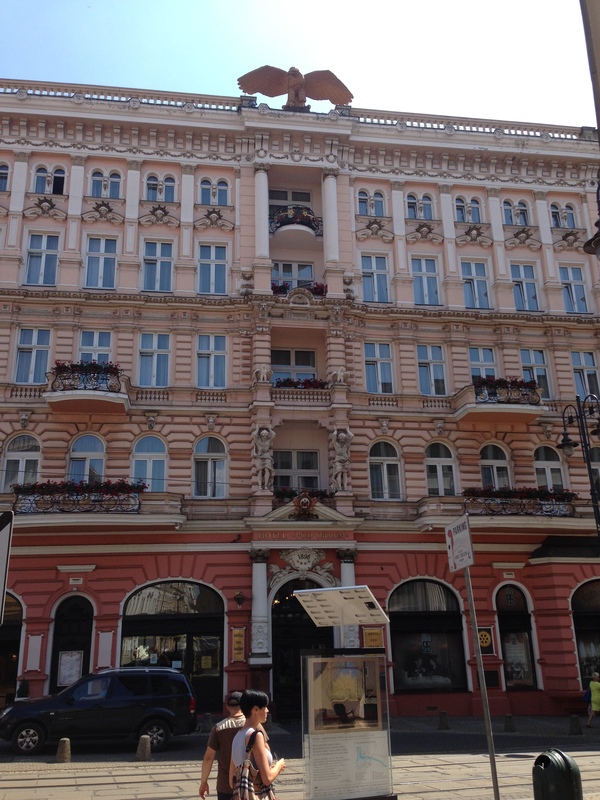 That is the Hotel Pod Orlem (translated “Under the Eagle”) where David stayed when he first arrived in January. It’s a four star hotel that has been continuously operating since 1898. Oh wait, you probably can’t see the Eagle, so let’s walk a little closer. See it now? Okay…now we are going to take a right and walk down the street towards the river. 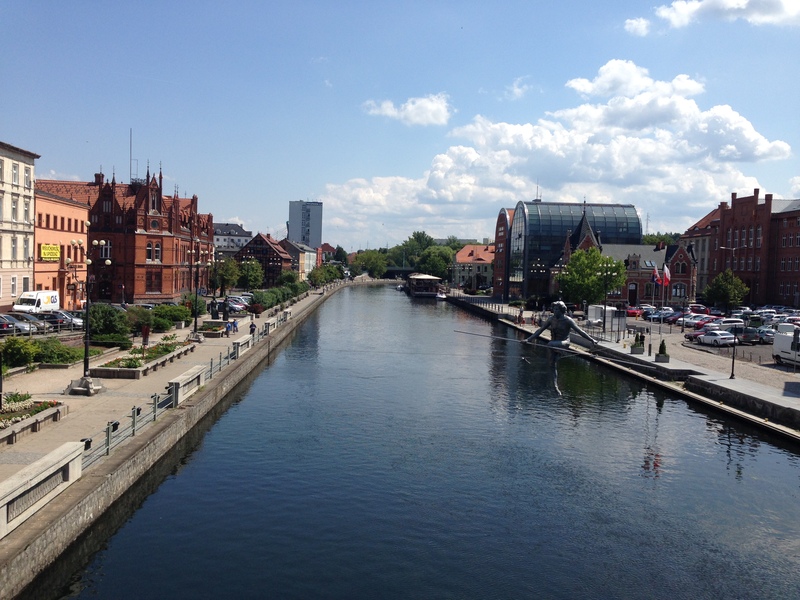 Yes, Bydgoszcz has a river running through it — the Brda (brr-DAH), but we’ll get there in a minute. 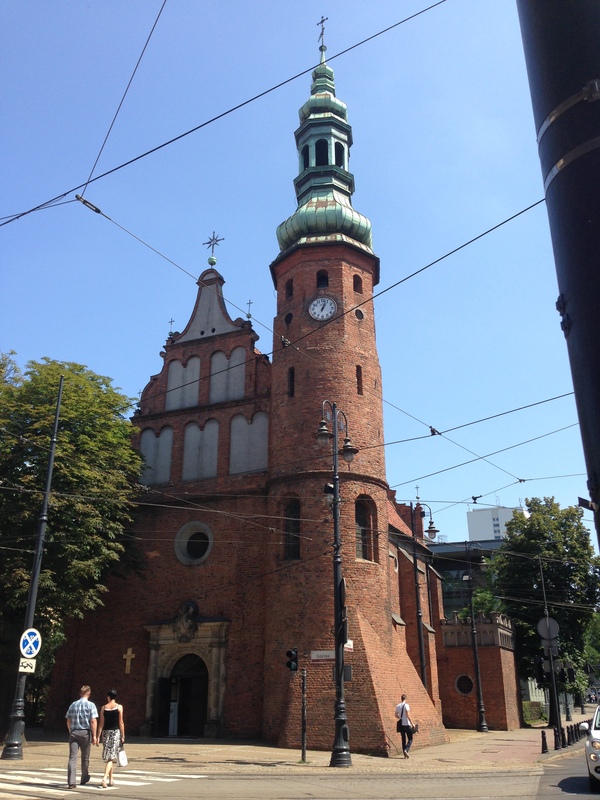 Right now we are walking towards that steeple which is this church, the Church of the Assumption of the Blessed Virgin Mary (or better known as the Church of the Poor Clares) which was occupied in the past by the local convent of the Poor Clares. It is on this side of the river because when it was originally built it was outside the city walls…Poor Clare’s nuns used it as a shelter for the homeless and it was also a hospital and there were concerns of spreading diseases. If you happen to walk by at noon, 3:00 p.m. or 6:00 p.m. you will hear a bugle call coming from the tower. Actually, you don’t need to be near it, you can hear it from a good distance away. It’s the city bugle-call which was composed on the 600th anniversary of the city of Bydgoszcz and they play it every day at those times. We are now on Gdasnka (so named because it used to be the road to Gdansk…or maybe it still it…that is a question for my map man, David). A lot of old architecture here, but you’ll also see more modern buildings too, like this shopping mall above. I’ve been in, but there aren’t many stores and not really worth going into…although it does have one of the few “coffee shops” inside….but I don’t like coffee, so I just walk right by. Lets keep walking and cross the street. No jaywalking here…everyone waits for the walk sign (and the tick-tock noise) before crossing. 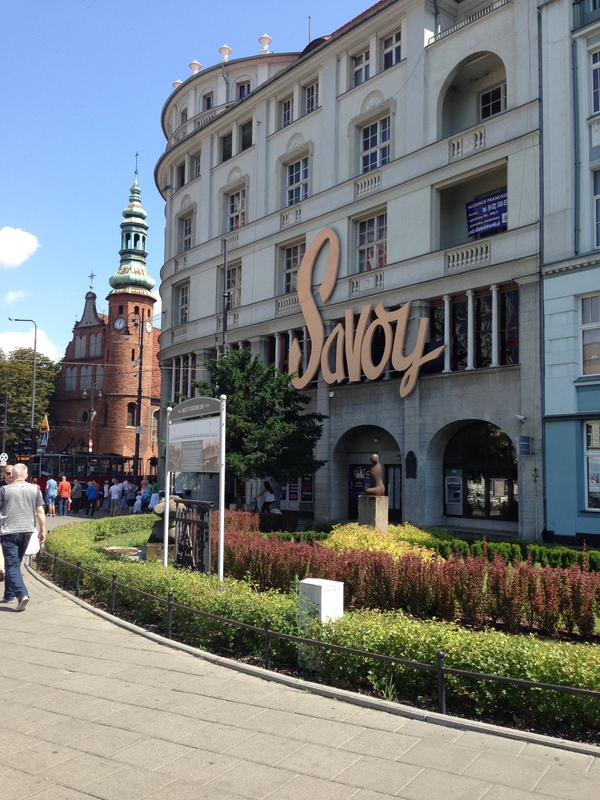 And we made is safely across…here’s the view looking back at the church….and the Savoy. I thought it was a hotel, but it’s a big dance/party club. And we are now standing on the bridge that crosses the Brda River. During the summer they have water trams that will take you up and down the river either because you don’t want to walk…or it’s just as a “tourist” thing to do. We haven’t done that yet…it’s on the bucket list though. Crossing this bridge takes you to the section called Old Town. But before we go there, let’s enjoy the view of the river. This is the view looking the other way. The red building on the left with all the spires is the Old Post Office. 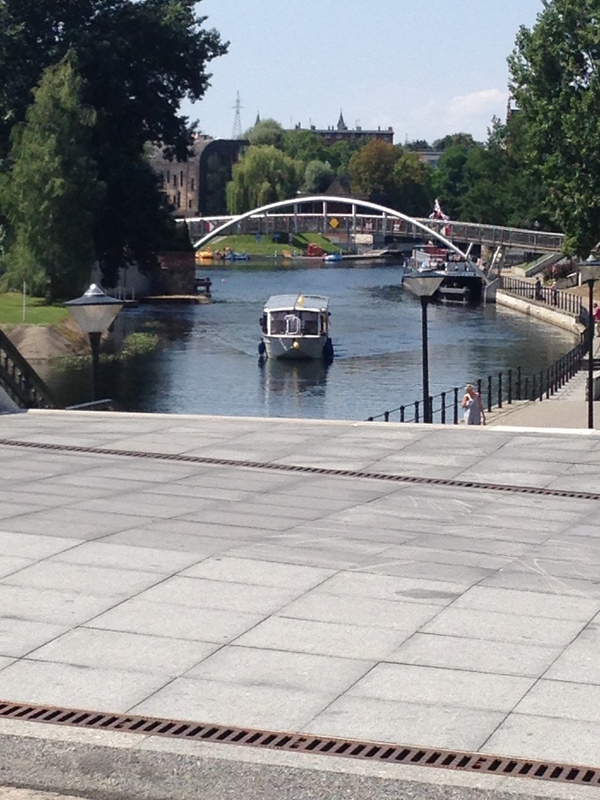 Did you notice the sculpture/statue of the tightrope walker that seems to “float” over the river? That is called “Man Crossing the River”. It was unveiled May 1, 2004 and commemorates Poland’s entry into the European Union. The statue hasn’t tipped over yet! Apparently it has to do with physics and that the center of gravity is on the bottom, plus he’s holding the bar….it all helps keep the statue upright. Let’s keep walking. If I was a real tour guide, I’d be holding up an umbrella and saying “We’re walking, we’re walking”. Just a short walk over the bridge and down the street and we are now in the Market Square in Old Town. 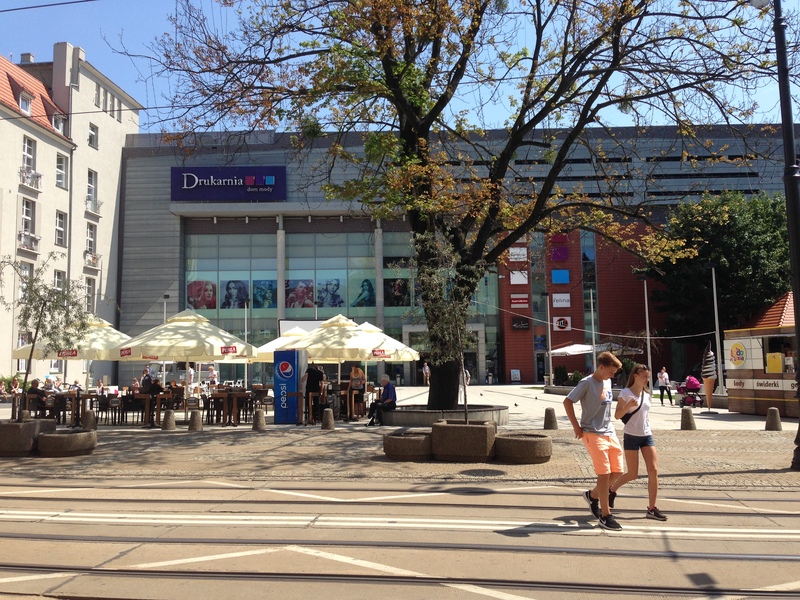 Lots of restaurants and pubs are around the square. 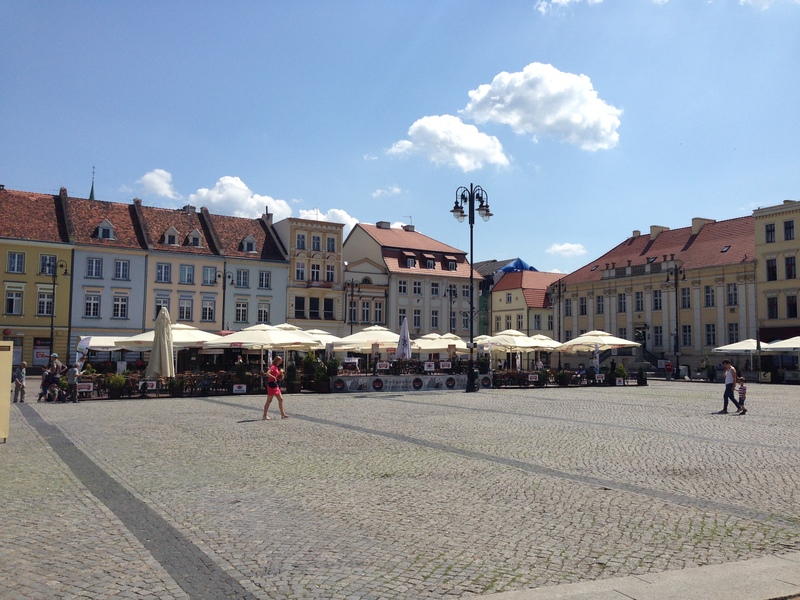 There is also a large library on one corner and a statue…every town square has at least one. 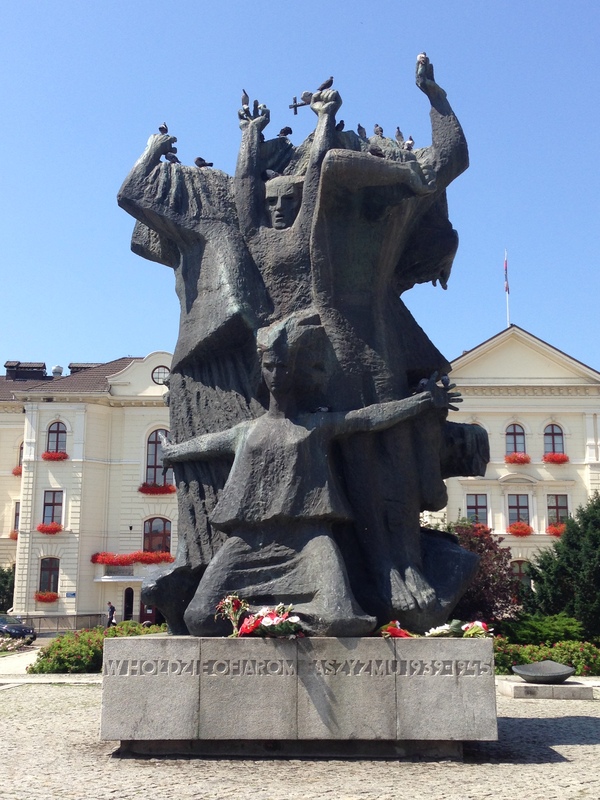 The Bydgoszcz Battle & Martyrdom Monument commemorates Bloody Sunday, September 3, 1939. That was when the German army killed innocent polish people right after Germany invaded Poland. This monument portrays the killing of forty Polish people on the same spot between 9-10th September 1939. The building behind the monument (the one with all the pretty red flowers in the window boxes) was a Jesuit College but now houses government offices. 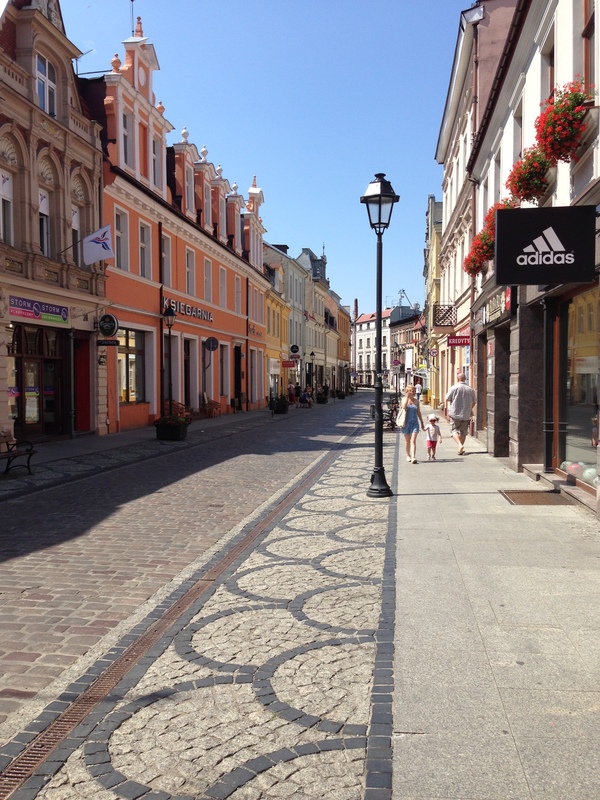 Narrow streets like this one run along behind the buildings that side on the square and are filled with small shops and eateries….along with a museum that I’ll tell you about in another post. There are also lots of benches to sit and rest a spell. And that is where I am going to leave you today…..so grab a bench and relax a bit. I’ll be back soon to finish our walk by going back for a stroll along the river and back home. It’s sunny out so I hope you brought your sunscreen! Yes you have! And you got tired too, that’s why I was letting you take a break and sit down on my blog so you’ll be ready for the next post! Thanks for the tour of the city! The architecture is wonderful, especially the Church of the Poor Clares. So happy that you decided to share your adventures with all of us!